A model element is an elementary component of a model. It will be created when you create a shape on a diagram. An example of model element is actor. You can visualize an existing model element or we sometimes call it to 'reuse' a model element with the model completion feature. 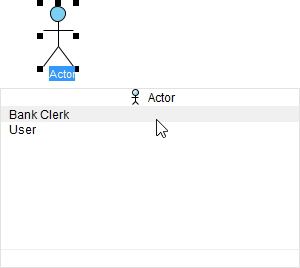 When you create a shape, press Ctrl-Space to popup a list of existing elements. Click on the desired element to reuse it. We call the visualized form of model element a view or a shape, depending on whether we want to emphasis the differences against model element or we want to focus on diagramming operations. When developing context-based diagrams, you will reuse a model element in different diagrams, resulted in the creation of multiple views. Each model element can associate with zero to multiple views. When you make specification-level change, such as changing of name on any view, the change will be applied to all views. If you want to open another view of an existing view (i.e. shape), right click on the view in the diagram and select Related Elements > Show Other Views... from the popup menu. Then, select the view to be opened in the Show View window and click Go to View to open the diagram.